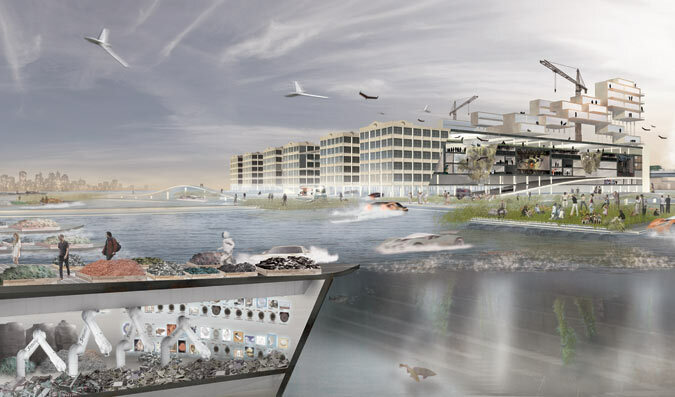 Glimpses of New York and Amsterdam in 2040 at the Center for Architecture (through September 10) is a clarion call for designers to redefine sustainability in architecture. 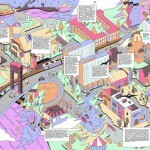 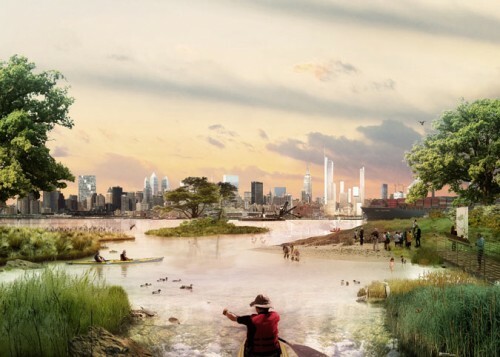 Though it didn’t start with this intention, the visions of 10 young architecture firms imagining future landscapes of New York and Amsterdam raise questions about what changes are imminent for urban development and what part architects can play. 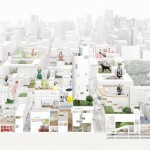 The projects suggest both practical and fantastical interventions to improve the prospect of urban growth in the face of ecological, geographic, and demographic shifts. The program comes hot on the heels of the announcements of Vision 2020: New York City Comprehensive Waterfront Plan and the similar strategy-based Structural Vision: Amsterdam 2040. 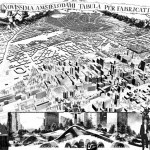 Curators Luc Vrolijks, Rosamond Fletcher, and Marlies Buurman’s collective ambition has been to use design and debate to link the two cities in the context of these new directives. 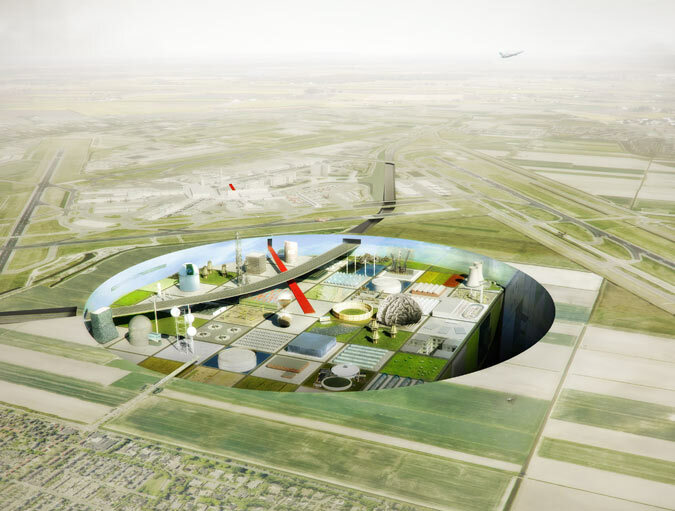 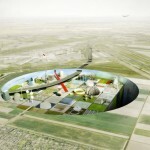 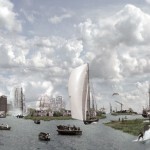 This month, the Center for Architecture hosted a series of talks and presentations of the work by the architects and the exhibit is also at the ARCAM site in Amsterdam until August 13, which will raise new questions about potential futures. 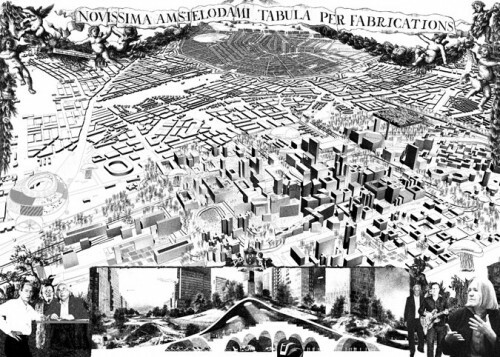 The projects responded to one of five headings: Breathing, Eating, Making, Moving, Dwelling. 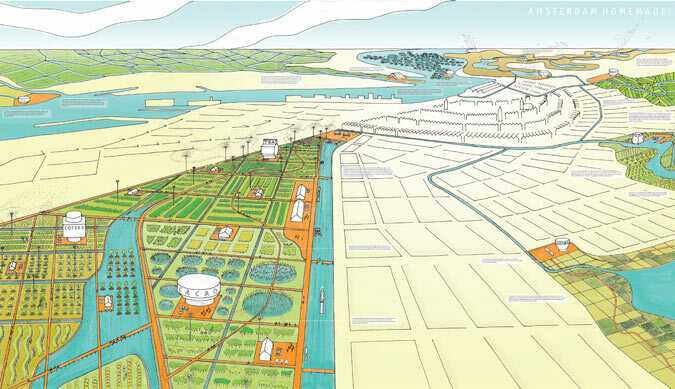 Both Delva with Dingeman Deijs and W Architecture and Landscape Architecture take water as their starting point. 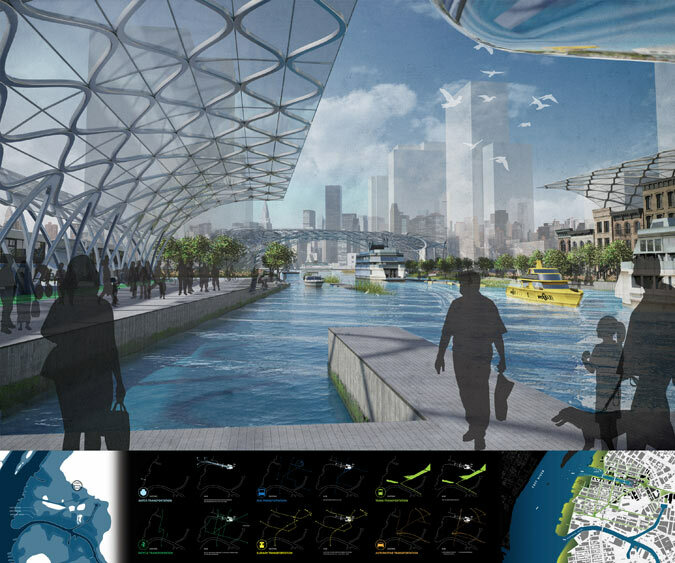 While Delva takes the IJ estuary as a generator for energy, W Architecture’s Hudson archepelagos, made using dredge from the port, provide habitats as well as landing banks. 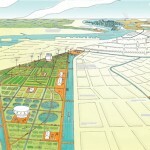 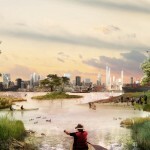 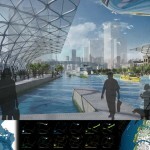 Here, WORKac focuses on the ‘food desert’ in the Bed-Stuy and Bushwick neighborhoods of Brooklyn and maps the potentially resourceful ways of re-appropriating the streets to harvest food, from future transportation (gondola-type links) to a hybrid fish farm and greenhouse-grown plants (Aquaponics). 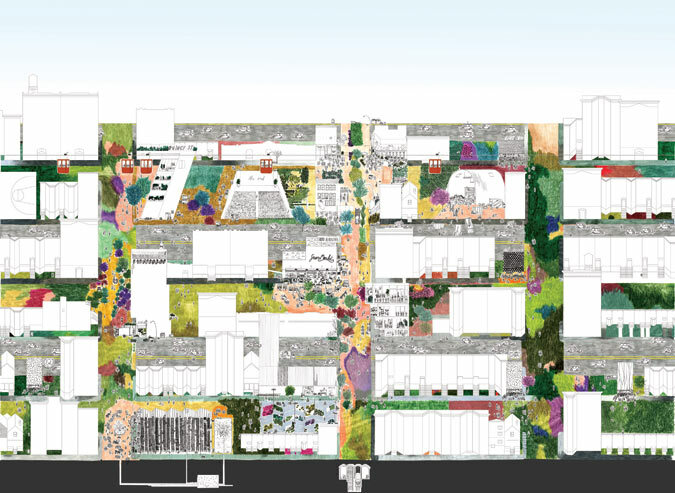 Van Bergen Kolpa Architects imagines a Landscape Supermarket, where varieties of food can be grown and sourced in park-like environments run by city dwellers. 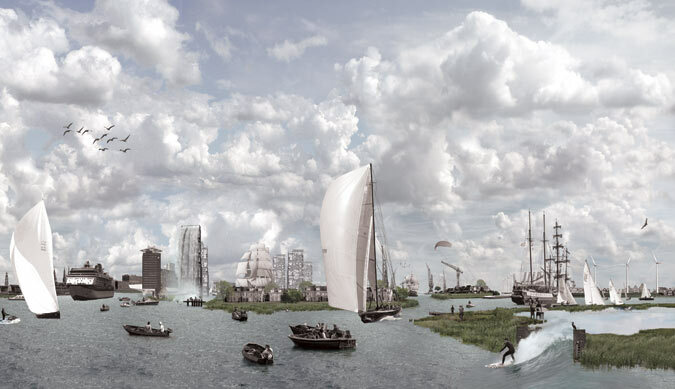 In The Refinery, Solid Objectives-Idenburg Liu (SO-IL) imagined a floating market place where robotic arms compartmentalise waste materials to mend a broken landscape. 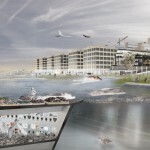 Barcode Architects on the other hand has developed a contained mega science park from which to export knowledge – “the most valuable commodity of The Netherlands in 2040” said Caro van der Venne of Barcode. 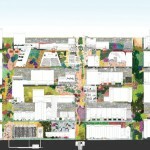 The Newark Visionary Museum by Interboro Partners and Space & Matter’s We is the New I both approached the idea of sustainability as social concerns. 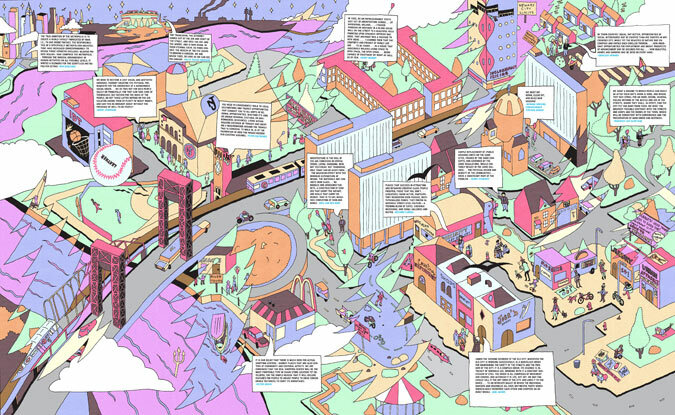 Interboro’s projection showed a colourful scene of failed plans and possible future solutions to Broad Street’s transportation, entertainment, sports and communication demands. 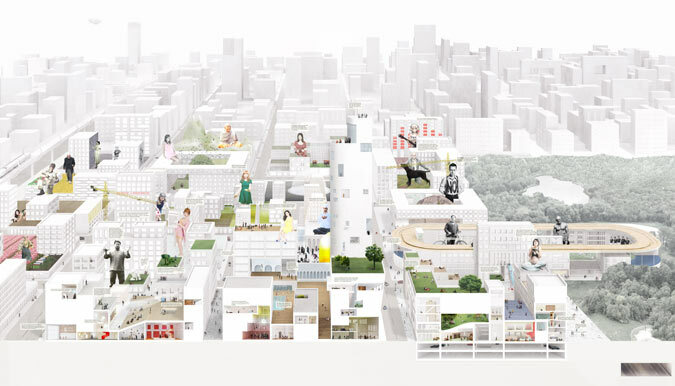 Similarly practical was Space & Matter’s solution to increasing diversity and social cohesion by harnessing and building around common interests.